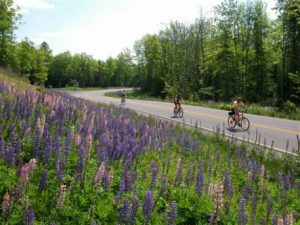 We've mapped out several scenic routes ( 10, 15, 28 and 50 miles ) that will take bicyclists on paved roads through rolling hills and past lakes, rivers, forests, wildlife and miles of blooming lupines throughout the southern part of Iron County. Registration begins at 6:30 a.m. with a group start at 8 a.m. The registration fee includes a tee, goodie bag, snacks, lunch coupon, water, and SAG vehicle support. Ready to join this ride? . Pre-Register On-Line by May 20 for a price break! Sign up here! There's also an early packet pick-up from 4 - 6 p.m. on Friday, June 7th at Carow Park on Friday where you can discuss the bike routes and get acquainted with event organizers and fellow riders. After the ride enjoy lunch and drinks from the concession stand as you listen to music with a beautiful view overlooking Grand Portage Lake. The Mercer Bird Festival will be under way at Carow Park with nature displays, kids activities, demonstrations, information booths and more!